"it’s a catch-all type of place"
Shoreditch has all the bars you could ask for but when it comes to the traditional comfort of the old-fashioned pub, it’s slim pickings. The Spread Eagle has the name and it is traditional of sorts - the bar rail warrants that tag in itself – but it pairs that with a rush of interior interest by way of its somewhat sultry décor. All dark wooden paneling, sinking sofas, kitsch and messed up furniture, it still manages to retain the comfort of a pub. Weekends are obviously busy given that it sits right on the corner of Shoreditch High street, just one in a number of busy bars that sit in a line-up. It has its ups and downs though; the music may be well picked but the drinks are fairly pedestrian, however focusing on negatives is for the negative. 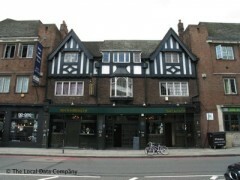 Its staff is friendly and the clientele the same so if you’re unsure of your Shoreditch then make for the Spread Eagle. Good for groups, friends and couples, you’d say it’s a catch-all type of place and considering the awful yellow and green sign, which could easily get it mistaken for a Walkabout or a Springbok bar, it does very well and makes for a solid choice. I drink here often during the week and there is always a nice crowd, friendly staff and some cool music. Its easy to get a table and you don't feel the need to dress up like in a few other places in Shoreditch. They have had some fun decorating and I wouldn't hesitate to recommend the Spread as a good bar to relax in.